Most of the time when I veganize or make a meatless version of a classic recipe, it feels special because I can now eat a dish that I enjoyed earlier in life. But this one is different, because I’ve never been a big egg eater. Oh, I could handle eggs if they were mixed all up in something and not highly detectable to my palate, but an egg sandwich? Not for me. This always made me feel like I was missing something. People love egg sandwiches—so they must be really good. I always wished I understood why. 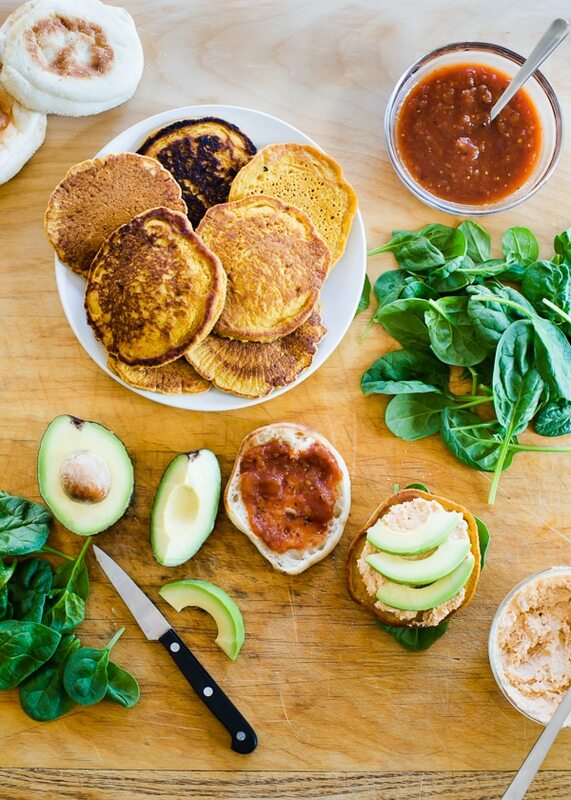 Now, thanks to these vegan breakfast sandwiches, I do! The “eggs” here are made from a seasoned chickpea flour batter. They’re savory and delightfully spongy. (Yes, “spongy” is good in this scenario!) The outside of the patties is ever-so-slightly crispy, kind of like mini-omelettes, and very much like the little egg patties you’ll often find on breakfast sandwiches. Topped with avocado, baby spinach and Cholula hot sauce-flavored cashew cheese, they’re also super fun and satisfying to bite into. Eggs are really easy to prepare, which is part of what makes them great for morning meals, but the chickpea “eggs” in these sandwiches are easy, too; they cook up in less than 5 minutes. You can make things even easier on yourself on groggy weekday mornings by mixing the dry ingredients the night before and blending up your Cholula cheese ahead of time. Come morning, make your eggs by adding liquid ingredients to the dry, then stir, grill, toast and assemble. It’s worth mentioning that I did test these on someone who is fond of egg sandwiches, and can confirm that they do possess all the good traits of eggs. Egg hater-approved and egg lover-approved. Can’t go wrong with that. 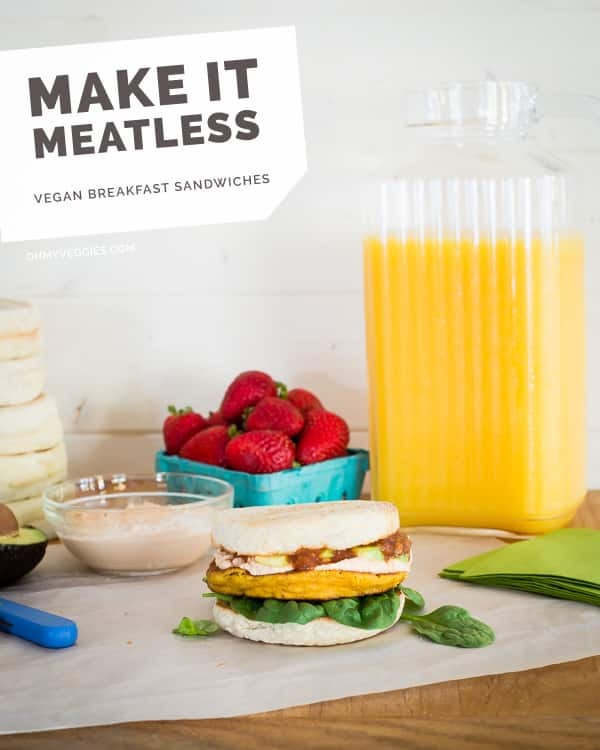 These satisfying vegan breakfast sandwiches are made with chickpea patties topped with Cholula cashew cheese and creamy avocado slices. The best part? With some advance prep, they come together in mere minutes, making them a delicious and convenient weekday breakfast option. As usual with cashew cheese, you’ll likely end up with more than you need. I wouldn’t recommend scaling down the batch size, unless you’ve got a very small and powerful blending device. Extra Cholula cashew cheese can be stored in the fridge for a couple of days for additional sandwiches or frozen. It also makes a great spicy mayo alternative for other sandwiches and burgers. These look delicious Alissa! I’m one of those people who can only eat eggs a set amount of time, so this would be great for me. Love the cholula cashew cheese! You must have been reading my mind, because I was JUST thinking about needing something like this! Thanks Jo! You could definitely do a lot with these patties – I love the idea of putting them into a salad! I do love eggs, but I can always use a new breakfast sandwich in my repertoire! I have a TON of chickpea flour in my pantry so can’t wait to try these! What brand of English muffin did you use for these sandwiches? I have had trouble finding a brand that does not contain dairy. Thanks! Saw this recipe featured in your Vegan Meal Plan for 1.30.17 post and made them this morning. I needed to sub Louisiana Hot Sauce (2 tsp) since I didn’t have the Cholula Hot Sauce. The only other change I made was to not serve them on English muffins; simply enjoyed them plated on spinach with the cashew cheese, salsa and advocado on top. Very good! I’m so glad you enjoyed them! I’ve eaten them without the muffins too – like mini omelettes. 🙂 Thanks Rita! Has anyone tried making the chickpea mixture and just making one patty at a time, storing the remainder in the fridge for a few days? I’m wondering if I could mix the batter on Sunday night for weekday morning breakfasts. Hi Suzanne! My only concern with doing that is that the baking powder would loose it’s ability to leaven as the batter sits, so any patties you make after the first day wouldn’t be as fluffy.